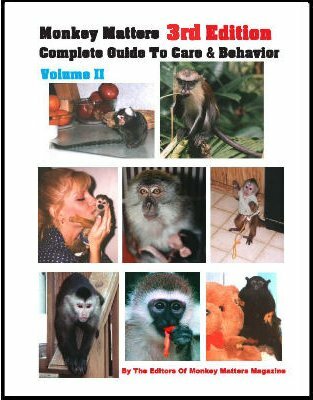 If you have a pet primate or you’re considering buying a pet primate, the Complete Guide To Care & Behavior is truly a must in your collection. This book is published by Monkey Matters and contains over 1000 pages of valuable information on primate care. One other book I would also recommend is the Primate Care Handbook which was published by the Simian Society of America. Unfortunately that book is no longer in print but you can still find it on Amazon.com or Ebay.com from time to time. Over 1,000 pages of illustrated information. Color photo covers and 10 color photo pages inside! Over 2000 black and white illustrations & photographs! Has detailed chapter contents and an index for easy referencing! Includes vital NEW information on formulas for infants. Includes chapters on understanding and coping with problem behaviors. New information on the effects of diet on hormonal imbalance, irritability & depression. Enrichment through good nutrition: Recipes for pregnant, nursing and pet monkeys. Thoroughly researched descriptions of species behaviors, including helpful illustrations. A thorough guide to primate enrichment. A complete chapter on social enrichment. Product information! Sanctuary information! Additional reading information! Unique and inspirational housing designs for indoors and out, plus planted enclosures! Chapter 7 – Diet & Exercise, Exercise: Born To Move! Next Entry: Are raw sprouts safe for monkeys? Next Entry Are raw sprouts safe for monkeys?